Did you know that Evanston residents use nearly 25 million plastic bags each year? In an effort preserve the beauty of Chicago’s North Shore, community members met last night to discuss whether a bag ban should be put into effect in this North Shore community. While there are pros and cons to each argument, there is no doubt that when only a small amount of plastic bags are recycled (only 1.5%), nature and wildlife on the North Shore are impacted. While there is still a decision to be made as to whether Evanston businesses will be forced to stop supplying plastic and paper shopping bags to North Shore residents, whatever law is mandated will go into effect January 1, 2012. Until then, all of us North Shore residents can do our part to cut down on plastic and paper bag use by making small changes in our everyday lives. The more we conserve and recycle now, the more the North Shore will thrive and remain a wonderful place to live, work and play. The next time you visit your local North Shore grocery store, take along a few reusable shopping bags. 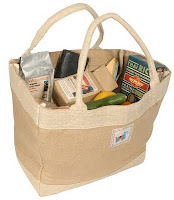 Healthy Green Goods in Evanston sells ChicoBag reusable shopping bags that you can use over and over again without harming the environment. Cut down on paper lunch bag use by purchasing a reusable lunch box and a reusable water bottle with a built-in filter for pure water on the go. Notice Accessories for Living is another North Shore boutique offering eco-friendly alternatives to everyday products. Their Mini Max Reusable Tote is great because it folds into its own zippered pouch for easy storage in the car for last-minute shopping trips. Another boutique to decorate your North Shore home in eco-friendly products is A Green Horizon in Evanston. With lunch items like reusable bamboo utensil sets, lunch sacks, chemical-free cleaning products and even planet-friendly pet products, this store has it all for helping you maintain a green lifestyle on Chicago’s North Shore. If you’re dreaming of relocating to Chicago's North Shore, I can help you find the perfect home. If you need to relocate from Glencoe, Deerfield, Winnetka, Wilmette or the surrounding area for any reason, I can help you sell your North Shore home quickly and at a fair price. Please contact me to get started!